pro.NET's fully customised reservation system can be easily integrated into any website, providing your customers with an accurate, secure and easy to use method of booking accomodation at your property. The system is controlled from an administration area that allows full control over which suites and promotions are available on which days, specifications of the rooms and promotions available and immediate notification of any bookings made. 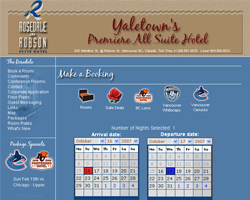 An example of this booking system in action can be seen by visiting www.rosedaleonrobson.com.